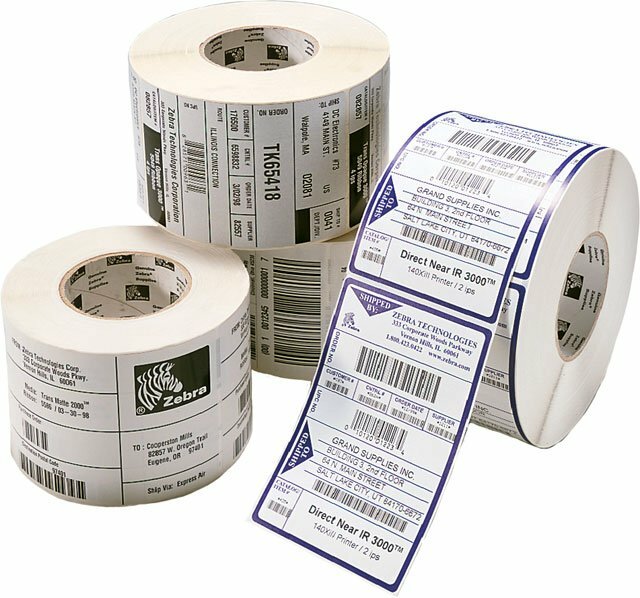 Thermal labels compatible with the Zebra LP 2824 Plus. 2.25" x 4" Direct thermal paper label. 700 labels/roll, single roll. Also available as a case (Part# 10015343). 2.25" x 4" Direct thermal paper label. 700 labels/roll, 12 roll case. Also available as a roll (Part# 10015343-R). 1" x 3" Direct thermal paper label. 840 labels/roll, single roll. Also available as a case (Part# 10010036). 1" x 3" Direct thermal paper label. 840 labels/roll, 6 roll case. Also available as a roll (Part# 10010036-R). 2.25" x 1.25" Direct thermal polypropylene label. 2,000 labels/roll, 6 roll case. Also available as a roll (Part# 10010063-R). 1.25" x 1" Direct thermal paper label. 2,340 labels/roll, single roll. Also available as a case (Part# 10010038). 1.25" x 1" Direct thermal paper label. 2,340 labels/roll, 6 roll case. Also available as a roll (Part# 10010038-R). 2.25" x 2" Direct thermal paper label. 1,370 labels/roll, 12 roll case. I was given these labels as a gift! They stick to just about anything that needs a label. Label your furniture, your paperwork, your letters, your children. They are fun for the whole family!